This review is for Keto Essentials Keto Multivitamin Adult Formula. It is a supplement that is designed to help those who want to have a healthy nutritional support as they follow a lifestyle of eating low carbohydrates and higher fat foods. This product helps to maintain healthy insulin and glucose levels, while supporting the conversion of carbohydrates into energy to be used by the body. According to the manufacturer the Keto Living formula is designed by leading medical and nutritional experts. All these vitamins and minerals work together in providing the body with the nutrients that it needs. However, other ketogenic products contain ingredients that help boost keto levels and performance. Considering these ingredients, this product could be beneficial for everyone that seeks to boost their overall health, not specifically for individuals on keto diet or those that want to boost keto levels. We could not find any information about the recommended dosage. The only information we could find is on the label of the bottle where it indicates that the serving per day is 6 capsules. The lack of instructions is a safety concern for the consumer. This product can be purchased from the manufacturer, through their website, for $46.95 for 180 capsules. We searched the web to see which retailers sell the product and the costs. We were disappointed not to find any, because this means that if there is a technical problem with the manufacturer’s website, the consumers will have to wait until it is fixed because they have no where else to buy this supplement. The manufacturer states that they offer a money-back guarantee. However, it is not stated how long it is. This puts the customer in the dark, because it is not safe to believe that you can return the product to the manufacturer any time. Some manufacturers can offer a money-back guarantee as short as 7 days after the date of purchase. Keto Essentials Multivitamin Adult Formula might be beneficial for people who follow a low carbohydrate and high fat diet. We like that the product is made from natural ingredients. The price is very reasonable, considering that there are 180 capsules inside. However, it is not wise to buy so many capsules when buying the product for the first time, just in case you do not like them, or they do not work for you. More especially because the money-back guarantee is unclear. We are concerned that the manufacturer offers a money-back guarantee, yet they do not disclose how long it is. This puts the customer at risk. Moreover, there are no reviews by consumers who have purchased and used the product. Reviews usually help so that the new consumer knows exactly what to expect when buying the product. Lack of reviews points to us that the product is not well known or it has not been used by many. We recommend that you look for a product that has clear instructions of the usage, clear money-back guarantee information and one with consumer reviews. 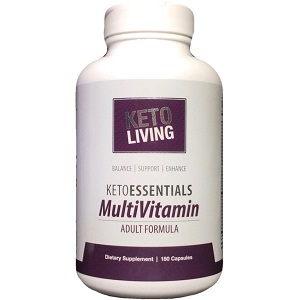 John Parker	reviewed Keto Essentials Multivitamin Adult Formula	on March 18th	 and gave it a rating of 3.